Thanks Lee! It is a great tool. To bad IBM won’t support it. I just downloaded 3.3.7 and keep getting the ‘The underlying connection was closed: An unexpected error occurred on a send.’ Any ideas what the issue could be? We recently stood up a new BigFix environment and had no issues with this in the past. @caerb43119 this is an error from Windows TCP connection. When are you getting the error, on what kind of operation? Is it on the initial connect, doing a large query? What version of BigFix Server, is Web Reports running SSL and in enhance security mode? If you search the net, there are many references to this error, but let’s figure out if something obvious. If you don’t know the answer to the above, no worries. Private message me and I will be happy to help debug. @caerb43119, I asked you the question but did not look at the code. Now that I look at the source, the Excel Connector does not work if you force security to TLS 1.2 only. This can be done using the following settings for Web Reports. If you have that set, it will force all communications to use only TLS 1.2, which the Excel Connector does not do right now. It still uses .NET Framework 2.0 that does not support TLS. Let me know if this is your case. Thanks to @caerb43119 for reporting the problem with the Excel Connector not being able to negotiate TLS 1.2. In order to support TLS 1.2, I have to upgrade the .NET Framework dependency from the very old 2.0 to 4.5.2. The new version is 3.3.8. This morning I downloaded the Excel Connector version 3.3.8 and I have a slight issue. I am running Windows 10/excel 2016. When I open Excel and execute the Query Wizard, when I select BES Properties, I am not able to select multiple values. It appears that the check box option to select multiple items is also missing. Hi @Mojea, it is correct that you can only select one BES Properties. Are you looking to extract different properties for computers? Then you should select BES Computers instead. I do have a question that I do not seem to find when I run a report on fixlets that need to be applied. When running the report I have a need to report on a “per server” basis. Right now it will list all the servers in one cell that need the fixlet. Is there a way to accomplish this. I need a report for all of our citrix servers. The only identifier is by name, but since they are all dumped into one cell a sort does not help either because I get all the servers that need this patch. @roberteastman I might need a picture to understand the issue. 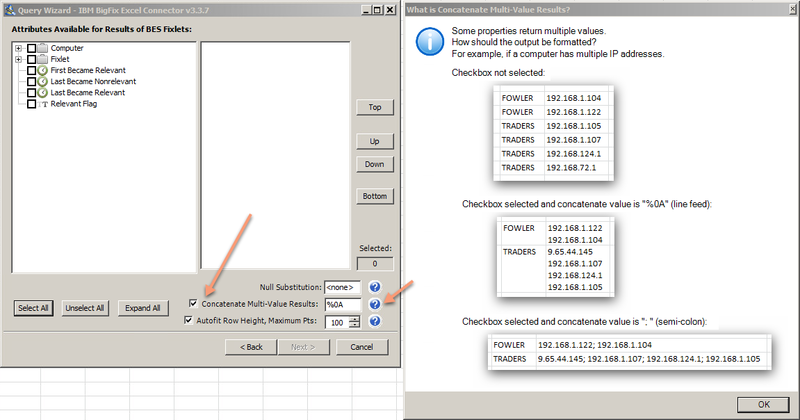 Have you seen this feature that will determine how “multi-valued” results are to be displayed? Leewei, I did not notice that check box. I reran my report without the check box and I can get the report the way I needed it. Thank you. I have been trying to figure out how to run this report with excel connector but am at a standstill on determining if this can be done. Management would like a report monthly of all the patches that were applied in the last 30 days. Since the connector is connecting to the DB I am sure that it can access this information but I am not seeing it in the choices when using it. Hello @leewei,thanks you for build a great tool.Could you know why my Excel Connector not display on Win2008 R2 Excel 2010 addon ? 17:41:14 0220 Starting the add-in registration process. 17:41:14 0220 Loading CLR: v4.0.30319. 17:41:14 0220 Calling CLRCreateInstance method. 17:41:14 0220 Calling GetRuntime method. 17:41:14 0220 Calling GetInterface method. 17:41:14 0220 Calling GetInterface method for the CorRuntimeHost interface. 17:41:14 0220 The CLR v4.0.30319 has been initialized successfully. 17:41:14 0220 Creating a new domain setup. 17:41:14 0220 Getting the add-in directory. 17:41:14 0220 The ‘shadow copy’ is disabled. 17:41:14 0220 Creating a new application domain. 17:41:14 0220 Getting the base directory for the domain. 17:41:14 0220 Success. The directory is ‘C:\Tivoli Endpoint Manager Excel Connector 3.3’. 17:41:14 0220 Searching for the Add-in Express core library. 17:41:14 0220 Success. The ‘AddinExpress.MSO.2005.dll’ file is found. 17:41:14 0220 Creating an instance of the ‘AddinExpress.Deployment.ADXRegistrator’ class. 17:41:14 0220 Assembly identity is ‘AddinExpress.MSO.2005’. 17:41:14 0220 Unwrapping the instance of the ‘AddinExpress.Deployment.ADXRegistrator’ class. 17:41:14 0220 Calling the managed registration procedure. 17:41:14 0676 Connecting to the application domain of the Add-in Express loader. 17:41:14 0676 Loading the ‘bigfixexcelconnector.dll’ assembly. 17:41:15 0676 Registering the ‘bigfixexcelconnector.dll’ assembly (administrator). 17:41:15 0676 The ’ bigfixexcelconnector.dll’ assembly has been registered successfully. 17:41:16 0220 The add-in registration process is completed with HRESULT = 0. 17:56:40 2076 9092 Starting the add-in registration process. 17:56:40 2076 9092 Getting the latest CLR version. 17:56:40 2076 9092 The latest CLR version is ‘v4.0.30319’. 17:56:40 2076 9092 Loading CLR: v4.0.30319. 17:56:40 2076 9092 Calling CLRCreateInstance method. 17:56:40 2076 9092 Calling GetRuntime method. 17:56:40 2076 9092 Calling GetInterface method. 17:56:40 2076 9092 Calling GetInterface method for the CorRuntimeHost interface. 17:56:40 2076 9092 The CLR v4.0.30319 has been initialized successfully. 17:56:40 2076 9092 Creating a new domain setup. 17:56:40 2076 9092 Getting the add-in directory. 17:56:40 2076 9092 The ‘shadow copy’ is disabled. 17:56:40 2076 9092 Creating a new application domain. 17:56:40 2076 9092 Getting the base directory for the domain. 17:56:40 2076 9092 Success. The directory is ‘C:\Tivoli Endpoint Manager Excel Connector 3.3’. 17:56:40 2076 9092 Searching for the Add-in Express core library. 17:56:40 2076 9092 Success. The ‘AddinExpress.MSO.2005.dll’ file has been found. 17:56:40 2076 9092 Creating an instance of the ‘AddinExpress.MSO.ADXLoaderSupport’ class. 17:56:40 2076 9092 Assembly identity is ‘AddinExpress.MSO.2005’. 17:56:40 2076 9092 Unwrapping the instance of the ‘AddinExpress.MSO.ADXLoaderSupport’ class. 17:56:40 2076 9092 Creating an instance of the XML parser class. 17:56:40 2076 9092 Loading the manifest file (C:\Tivoli Endpoint Manager Excel Connector 3.3\adxloader.dll.manifest). 17:56:40 2076 9092 Getting the root element of the manifest (C:\Tivoli Endpoint Manager Excel Connector 3.3\adxloader.dll.manifest). 17:56:40 2076 9092 Getting the ‘assemblyIdentity’ element of the manifest (C:\Tivoli Endpoint Manager Excel Connector 3.3\adxloader.dll.manifest). 17:56:40 2076 9092 Searching for the ‘name’ attribute of the ‘assemblyIdentity’ element. 17:56:40 2076 9092 Success. The name is ‘BigFixExcelConnector, PublicKeyToken=bef2983f1300af93’. 17:56:40 2076 9092 Calling the managed procedure to register the ‘BigFixExcelConnector, PublicKeyToken=bef2983f1300af93’ assembly. 17:56:40 1996 9092 Connecting to the application domain of the Add-in Express loader. 17:56:40 1996 9092 Loading the ‘BigFixExcelConnector, PublicKeyToken=bef2983f1300af93’ assembly. 17:56:40 1996 9092 Registering the ‘BigFixExcelConnector, PublicKeyToken=bef2983f1300af93’ assembly (user). 17:56:41 1996 9092 The ’ BigFixExcelConnector, PublicKeyToken=bef2983f1300af93’ assembly has been registered successfully. 17:56:41 1996 9092 The managed registration process is complete with HRESULT = 0. 17:56:41 2076 9092 The add-in registration process is completed with HRESULT = 0. @teerapongpa, there are no errors in the logs, which is a good sign. We want to make sure that the BigFix Connector is checked and no errors from Excel. Is there any security policy block? @teerapongpa, there are no security policy blocks that will impact this. When you install the addin, it should have by default installed in c:\users[name]\appdata folder. 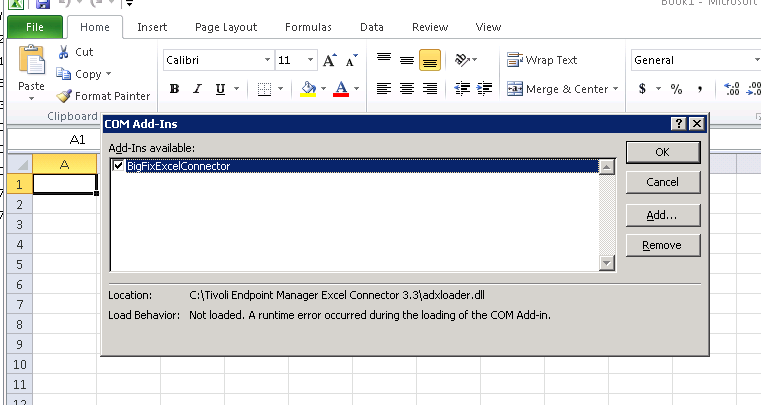 The fact that your say c:\Tivoli Endpoint Manager Excel Connector 3.3\ means that you changed it correct? I wonder if because the user does not have permission in this folder structure. Command Line: "C:\Program Files (x86)\Microsoft Office\Office14\EXCEL.EXE"
18:28:50:176 1356 6204 Starting the add-in registration process. 18:28:50:176 1356 6204 Getting the latest CLR version. 18:28:50:176 1356 6204 The latest CLR version is ‘v4.0.30319’. 18:28:50:176 1356 6204 Loading CLR: v4.0.30319. 18:28:50:176 1356 6204 Calling CLRCreateInstance method. 18:28:50:176 1356 6204 Calling GetRuntime method. 18:28:50:176 1356 6204 Checking if the hosting API of .NET Framework v4.0 beta is installed. 18:28:50:176 1356 6204 The hosting API is up to date. 18:28:50:176 1356 6204 Calling GetInterface method for the CorRuntimeHost interface. 18:28:50:176 1356 6204 Getting the CLR version. 18:28:50:176 1356 6204 The CLR v4.0.30319 has been initialized successfully. 18:28:50:176 1356 6204 Creating a new domain setup. 18:28:50:176 1356 6204 Getting the add-in directory. 18:28:50:176 1356 6204 The ‘shadow copy’ is disabled. 18:28:50:176 1356 6204 Creating a new application domain. 18:28:50:176 1356 6204 Getting the base directory for the domain. 18:28:50:176 1356 6204 Success. The directory is ‘C:\Users\cisdtpan\AppData\Roaming\IBM\IBM BigFix Excel Connector 3.3.8’. 18:28:50:176 1356 6204 Searching for the Add-in Express core library. 18:28:50:176 1356 6204 Success. The ‘AddinExpress.MSO.2005.dll’ file has been found. 18:28:50:176 1356 6204 Creating an instance of the ‘AddinExpress.MSO.ADXLoaderSupport’ class. 18:28:50:176 1356 6204 Assembly identity is ‘AddinExpress.MSO.2005’. 18:28:50:176 1356 6204 Unwrapping the instance of the ‘AddinExpress.MSO.ADXLoaderSupport’ class. 18:28:50:176 1356 6204 Creating an instance of the XML parser class. 18:28:50:176 1356 6204 Loading the manifest file (C:\Users\cisdtpan\AppData\Roaming\IBM\IBM BigFix Excel Connector 3.3.8\adxloader.dll.manifest). 18:28:50:176 1356 6204 Getting the root element of the manifest (C:\Users\cisdtpan\AppData\Roaming\IBM\IBM BigFix Excel Connector 3.3.8\adxloader.dll.manifest). 18:28:50:176 1356 6204 Getting the ‘assemblyIdentity’ element of the manifest (C:\Users\cisdtpan\AppData\Roaming\IBM\IBM BigFix Excel Connector 3.3.8\adxloader.dll.manifest). 18:28:50:176 1356 6204 Searching for the ‘name’ attribute of the ‘assemblyIdentity’ element. 18:28:50:176 1356 6204 Success. The name is ‘IEM Excel Connector, PublicKeyToken=bef2983f1300af93’. 18:28:50:176 1356 6204 Calling the managed procedure to register the ‘IEM Excel Connector, PublicKeyToken=bef2983f1300af93’ assembly. 18:28:50 1908 6204 Connecting to the application domain of the Add-in Express loader. 18:28:50 1908 6204 Loading the ‘IEM Excel Connector, PublicKeyToken=bef2983f1300af93’ assembly. 18:28:50 1908 6204 The managed registration process is complete with HRESULT = 2. 18:28:50:192 1356 6204 The system cannot find the file specified. Amazing utility you created, it has been very helpful. Is there support for windows 10. The latest version uses .NET framework 2.0, wondering if it will be coded to use a more recent version. Latest version uses 4.5.2 NET framework. Info is in the original post.